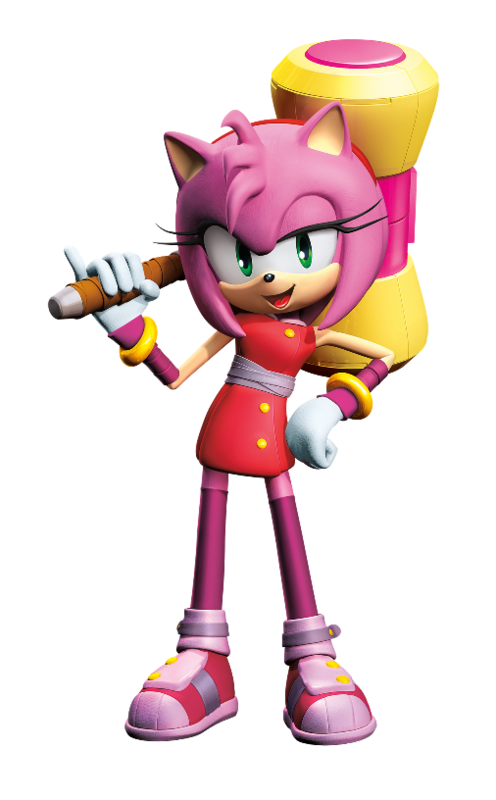 She's Fantastic: Sonic the Hedgehog - Sonic Boom AMY! Sonic the Hedgehog - Sonic Boom AMY! I was very sad earlier this year when I finally caught on to the fact that Jazwares had lost the Sonic the Hedgehog license. I had been a fan of Sonic since I got my first Game Gear way back in Middle School. I had watched the franchise grow long after I stopped playing video games and I was always upset that I no longer had ties to any of it. Like I said, I stopped playing games, and the comics just weren't my speed. Then I discovered Jazwares amazing 3" line of hyper-articulated Sonic action figures. I was immediately trying to figure out who all the new characters were so I could predict the toy lineups. I was pleasantly surprised to find an abundance of cool females in Sonic Universe. Amy, of course, is the most popular of the bunch. She's always the first girl released in any Sonic toy series, so she's not necessarily indicative of a heavily female-inclusive line, but I have a really really good feeling about this new Tomy line. Despite the loss I still feel about the axed Rouge and Cream figures from Jazwares, I think Tomy will keep this line and scale thriving for many years to come. Let's check out this new Amy figure below! 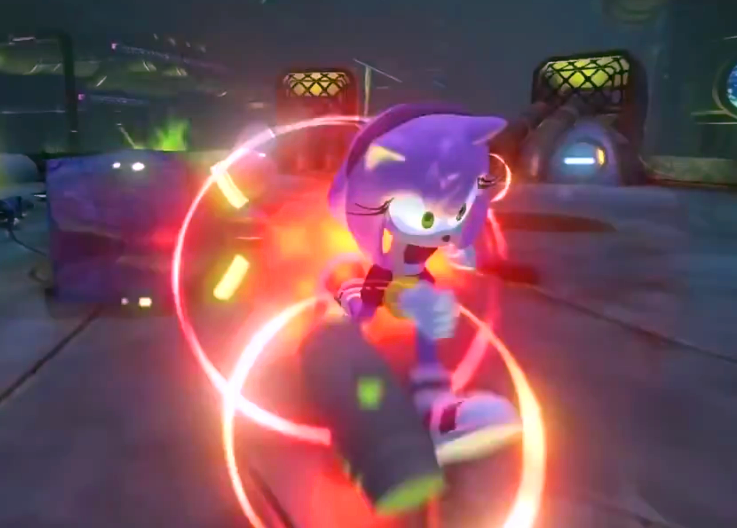 Amy comes packaged with an "Enerbeam" accessory. I'm honestly just guessing that it's supposed to be an energy emission from their hands, but I have no frame of reference. It's made of a stiff rubbery translucent plastic. Amy shares a 2-Pack with her "boyfriend" Sonic. They each have five points of articulation: Head, legs, and shoulders. 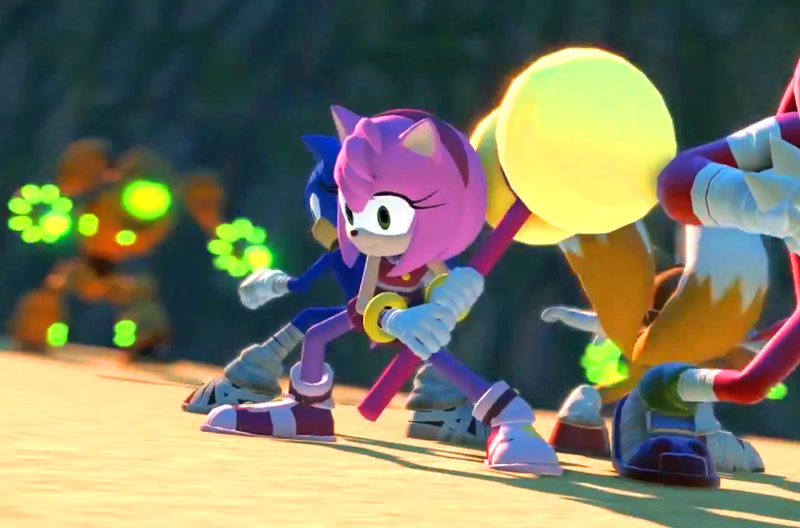 Here are some images of Amy in her new outfit from Sonic Boom. Here she is with the Jazwares Amy from 2010. And here is the addition of the 2010 Comic Pack Amy from Jazwares. These Tomy figures look nice! They look to be a lot more sturdy then the Jazwares versions. Yeah. Dare I say that the Jazwares figures were TOO articulated? I believe they had 18 points of articulation and on such big-headed/twiggy-limbed figures that made them a bit wobbly. It always bothered me that their knees and elbows bent both ways. Having that natural "stop" in place to prevent them bending at an unnatural angle is what helps a lot of figures stand on their own.